Today is World Book Day, a wonderful opportunity to address this #ChallengeRichard sent in by Mike Gonzalez of New Jersey: Make a list of your top 65 books to read in a lifetime. The authors of Abundance go so far as to claim that "technology has the potential to significantly raise the basic standards of living for every man, woman, and child on the planet." Before you disagree, read the book. They make a fascinating argument, and make me happier than ever that I ditched my dream of being a doctor to enter the unpredictable world of IT. We live in exciting times. I love Peter Diamindis' book called "Abundance." I absolutely loved it. Basically if you want to know the future, read Bold. Supplement it with “Abundance” by the same two and “Tomorrowland” by Steven Kotler” and even “The Rational Optimist” by Matt Ridley. 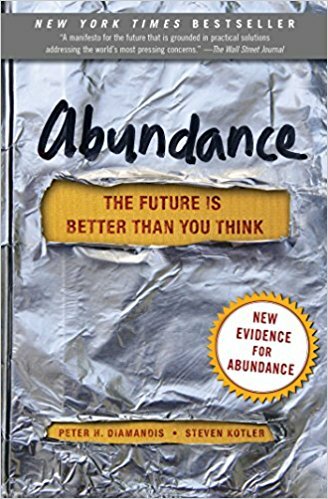 I feel “Abundance” is like a sequel to “The Rational Optimist”. So I’m giving you four books with one recommendation. (Note: When asked what books had the biggest impact) A few that come to mind include: Abundance by Peter Diamandis, Life at the Speed of Light by Craig Venter and How Will You Measure Your Life? by Clayton M. Christensen, James Allworth, and Karen Dillon. However, every book I’ve read has impacted my thoughts in a different way. Whenever I am excited by a new topic or industry, such as the microbiome – which has resulted in the formation of Viome, I read any and all books on the topic. Each book contributes to my thought process and what is the next step to take.